These Stuffed Turkey Bundles with Gravy are my idea of pure comfort food. I would name gravy as one of my favorite things. It’s my favorite part of Thanksgiving dinner, and turkey and stuffing are two of my favorite vehicles on which to deliver the gravy. While nothing will ever beat my mom’s gravy on Thanksgiving Day, These Stuffed Turkey Bundles with Gravy give me similar feelings of comfort, satisfaction and happiness. They’re hearty and filling and the stuffing inside is moist and flavorful. The whole dish kind of reminds me of Thanksgiving flavored Salisbury steak. One of the best things about this recipe is that each serving comes with ½ cup of rich, flavorful chicken gravy, which is enough to pour over your stuffed turkey bundle and your side dish of choice. 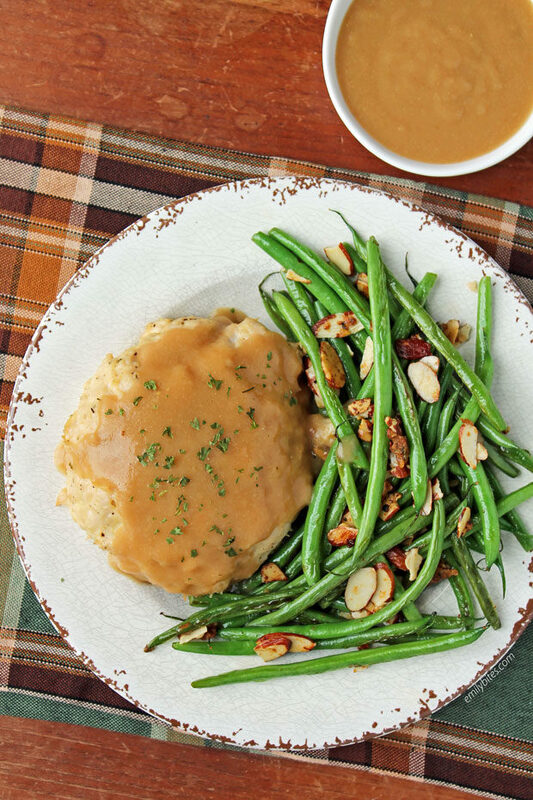 Green beans, squash, mashed potatoes, rice – everything is better with gravy, right? My husband even said this recipe is one of the best things I’ve made him in quite a while. 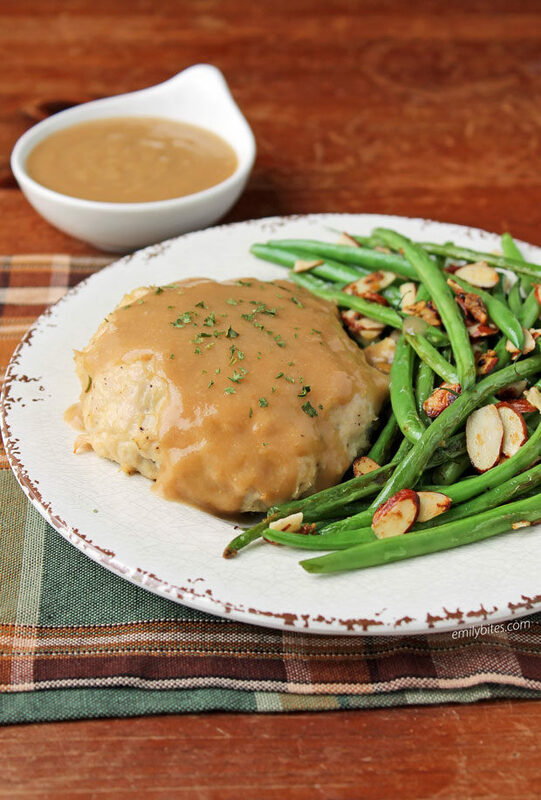 Better still, each serving of these Stuffed Turkey Bundles with Gravy is just 342 calories or 5 WW Freestyle SmartPoints! Looking for more tasty, lightened up comfort food dishes like these Stuffed Turkey Bundles with Gravy? Check out my Meat and Potatoes Bake, Chicken Pot Pasta, Chicken and Squash Wild Rice Casserole, Butternut Squash Pasta with Bacon, Creamy Chicken and Gnocchi Soup, One Pot Dirty Rice with Chicken and Sausage, Turkey Sloppy Joe Pasta, Cheesy Buffalo Chicken Chickpea Bake, Crispy Cheddar Chicken with Cream Sauce, Rustic Sausage and Potato Skillet, Cottage Pie, Beef Stroganoff, Beefy American Goulash, Chili Cornbread Bake, Pimento Cheese Stuffed Chicken, Bubble Up Chicken Pot Pie Casserole, Pumpkin Alfredo Tortellini Skillet, Cheesy Bacon BBQ Chicken, Broccoli Cheddar Soup, Slow Cooker Beef Stew and many, many more in the Comfort Food section of my recipe index! Bring ½ cup of the broth to a boil in a small sauce pan. Stir in the stuffing mix and cover. Remove from heat and allow to sit, covered, for 5 minutes. Fluff with a fork. Combine the ground turkey, egg, milk, minced onion, thyme, salt and pepper in a mixing bowl and stir until combined. Divide the ground turkey mixture into 8 equal pieces and flatten into thin patties (side note: ground turkey is sticky, so the mixture will be sticky – this is normal, just do the best you can). Divide the prepared stuffing into four parts and place the stuffing in the center of four of the patties. Cover those patties with the remaining patties and press the edges together to seal the stuffing inside the meat patties. Place the turkey bundles in a 9×13 baking dish and bake for 35-40 minutes until cooked through. While the bundles are baking (with about 15 minutes left in the cook time), bring the butter over medium heat in a medium saucepan until melted. Add the flour a little at a time, whisking it into the butter until combined. Cook for 2-3 minutes, stirring regularly. Reduce the heat to low and add the remaining 2 cups of broth a little at a time, whisking it into the flour mixture until smooth and well combined. Add the Better Than Bouillon paste and Gravy Master sauce. Increase the heat to medium and stir regularly until the gravy boils and thickens. Remove from heat and allow to sit for at least 5 minutes. The gravy will thicken upon standing. Serve each stuffed turkey bundle with ½ cup of gravy. What a great idea! How does 2 ounces of stuffing measure cup-wise? I didn’t measure it that way, so I’m not sure if that amount directly translates into cup measurements. Sorry! I just weighed it. If I get a chance I’ll try to figure it out, but it may not work out to be an exact cup amount. What is gravy Master sauce ? You can alternatively use kitchen bouquet. Both are used to flavor and color gravy! What a clever recipe! I’ve not used Gravy Master (or Kitchen Bouquet) and don’t even know where in the grocery store to look for either! Can you give me a clue? I’m also curious about whether BTB has a low sodium version. Do you know? Finally, do you think the bundles would freeze well once assembled? I’m just cooking for one. Thanks! Keep up the good work! Better than Bouillon does have a reduced sodium version! I think different stores keep Gravy Master/KB in different locations, but it’s in pretty much every grocery store I’ve been in. I’ve usually seen it in either the spices section or by the gravy (near the jarred and packet gravy). I never freeze anything so I can never answer this question from experience, but I don’t see why not with these. This looks so good. I’m just cooking for two, and we decided not to go with a turkey this year. This recipe is perfect for getting the stuffing fix, staying sort of traditional without all the fuss. Thanks for this! I hope you love these as much as we did! GUUUUURL you are my gravy soulmate!! So excited to make these!